At least that's how I felt about the crummy orange oak on the first floor. It was laid around the time the house was split, presumably to help hide some of the floor plan changes, as well as the then out of fashion pine planks. The discrepancy between it and the original 1880's quartered oak with inlaid mahogany floors makes one wonder how the two woods could have originated from the same type of tree. 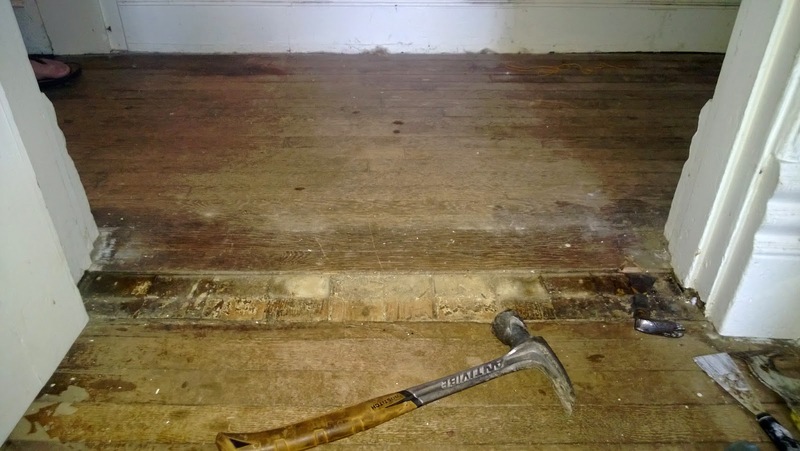 To add insult to injury, it was laid against the original shoe molding, the same direction as the original floor, and was covered in rather severe stains. I removed the first section when we restored the layout of the staircase, before I started the blog. This revealed a discrete patterned landing area that confirmed that I made the right call on how to build the stairs (only off by one inch when all was said and done)! Removing that section showed that it butted up to faux finished pine in the current entry room, which carries through to the dining room. it'll be so nice to have even floors! The next section we pulled out was the hallway to the bathroom (in this post here), both of which used to be part of the dining room. I was hoping to find ghost marks of a built-in on the floor, which weren't there. We can now assume that any built-in would have been on the wall that was demolished when the kitchen addition was built in the 1890's. There is some evidence on this section of where the passage from the front parlor to the dining room was, just based on wear, as well as two strange sections I haven't figured out yet. This floor is also faux finished pine, and most likely had wall to wall, or a tacked down central carpet from day one. I've stripped a third of the floor of the oak so far, revealing, as expected, faux finished, random width southern yellow pine just like upstairs. The center is as naked as the day it was installed, just missing it's carpet. What wasn't expected is just what good condition it's in. The only flaws are a slight warp at the wall where the oak had a huge number of stains (likely from the pets of previous owners), one buckled board from the weight of the radiator foot, and the inevitable nail holes from the oak. Surprisingly, the faux finish is in incredible condition as well. It was designed to look like rift sawn oak, and is fairly convincing while you're standing. Although we had it throughout the house upstairs, this has been the only time it's been in good enough condition to get the full effect. See how the building paper jogs in about an inch just past the plinth? This suggests that I was almost dead on in deciding how much to open up the doorway (it had been just a single door when we bought the house). The longer section of paper likely protruded into the original doorway. The second is more of a question. See that hole? I can think of only one reason for it's odd location. I've seen historic dining rooms where there was a servant call button on the floor at the head of the table (you would tap it with your foot). The location would be dead on, and this house had speaking tubes and annunciators - BUT, as far as we know this wasn't a dining room. At the same time, we now know that the kitchen wing was an addition, meaning that there's really no reason this couldn't have been the original dining room. All the fuss over today's pre-finished floors and it turns out they've been around for a long while. They likely went out of style when people figured out that they offered no protection for spills (or pet accidents) that go right through the joints. I wonder how long it'll take people to figure that out this time around? I don't see it working to sand part of the floor. It looks like yours are in much better shape than mine, but I would still imagine that you'd need to sand so much off that you'd see a visible depression around the outside of the sanded area. I agree that either of the other two would look fantastic. The upside of sanding is you get to show off your awesome slow grown heart pine, which is priceless today, even if it was ordinary back when your house was built. But on the other hand, you'd be irreversibly removing the faux finish, which like you said is an unusual original feature. I think you're gonna get sucked into doing it the hard way in this room. Plus, everything else you've done is really period correct. On the bright side, you won't have dust! Stunned at how lucky you are to have this house, and how lucky the house is to have you. I'm so thankful we went with our hearts on this house. It fell so short of our one criteria (untouched), but she rewards us for taking the chance everyday. D. Restore the original finish and leave the centre untouched, covered with a large rug. Convincing faux grain work isn't something I could imagine doing myself, not without an insane learning phase AND someone competent showing me how to do it. That would certainly be the easiest, I just don't want to be forced to have a rug in a specific spot. I'm going to start by trying to match the finish of the spots that need to get patched - if I'm miserable at it I won't bother with the middle.